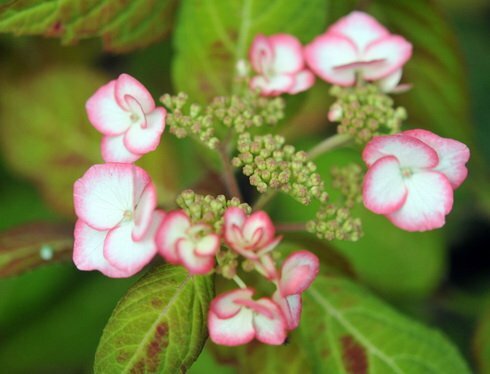 A good small shrub with Picotee pink/white flowers and red tinted foliage in spring. This is a species is widespread across Japan and into Korea but there are now numerous hybrids taken from it and this is one of the better ones. It only reaches around 1 metre high or so and can be readily pruned hard in early spring for best results and bigger flowers. 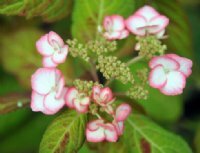 Foliage is fairly rough in texture and a little more pointed than the macrophylla types and often with a red colouration adding to the interest. Flowers are on this selection being a white/pink picotee and they are held in typical hydrangea clusters making a large flower head.